I am a yoga teacher, PADI Divemaster and Assistant Instructor in free-diving. For me these three aspects of my training fit perfectly together to improve my diving ability and time underwater (with and without tanks!). The jigsaw all came together during a course in Dahab, Egypt, where we trained in yoga and diving. So I will begin my story, and future series of articles on yoga and diving with my first experiences. Boris takes a deep breath in and rises up from the floor, his head clearing a good meter off the sand, upside-down. With a long blow of bubbles he drops back down before rolling into a ball and gliding effortlessly into the blue. This is yoga-diving. Two words rarely heard in the same sentence, and an unlikely hobby for the vast proportion of burly, gadget-heavy divers who would rather relax with a cigarette on the shoreline than flex legs over their head into the plow pose. So rare is this marriage, that very few dive centres and guides explicitly use yoga in training and recreational diving. An online search revealed only Monica Farrell’s operation in Dahab, working out of the Reef 2000 centre at the Bedouin Moon Hotel. Along with instructors Barbara, Boris and Reiner, they offer yoga in combination with traditional scuba courses and diving on the local reefs including The Canyon and Blue Hole. Yoga can help you relax before a dive, increase air consumption and teach you a few fancy poses to show off on your next safety stop. 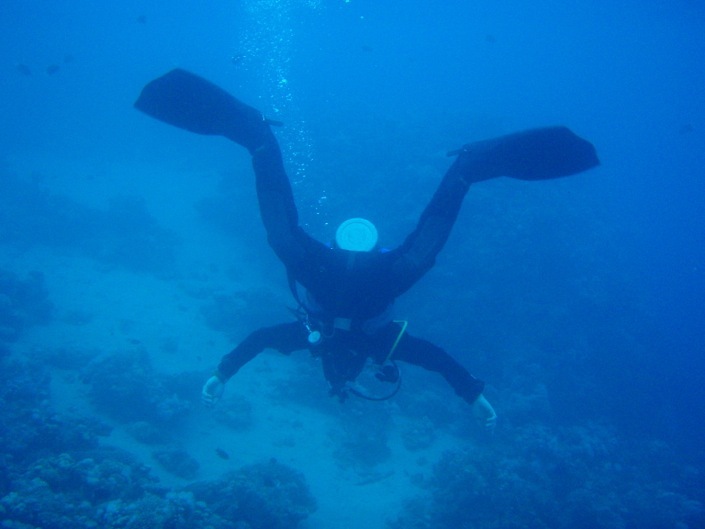 Boris explained that many divers struggle to descend at the start of a dive because of stress and anxiety, not weight and not necessarily ear problems. The universal ‘solution’ tends to be extra lead, rather than taking a moment to slow down, breathe deeply and allow yourself to sink on the out-breath. 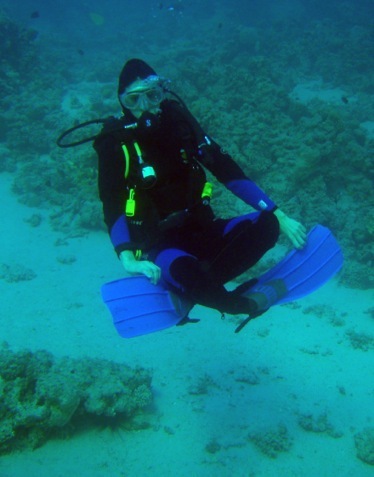 Yoga diving is not about doing yoga poses under water – for that you need perfect buoyancy and a lot of practice. Just trying the lotus pose sent me into a backward roll as my weight tipped me off-balance. Each morning we did 90 minutes of Hatha Yoga to stretch and strengthen the body, and then took the principles down to the reef. This included a snorting exercise called the ‘breath of fire’, which can come in handy for clearing your mask, as well as slowly building stronger lungs. Yoga also gives you a few tips for dealing with life above the waterline. “Your mind is like a drunken monkey, swinging from tree to tree, completely out of control” said Monica one morning. “Yoga says the way to relax is to empty your mind. To do that you need to focus. Standing on one leg is a pretty good way to focus the mind” she laughed as we wobbled in a line, arms flailing. After a few days I found I was meditating on my audible breath through the regulator. Not so much away with the fairies, but certainly with the fish. Tucking my camera into my BCD pocket, I started to enjoy just watching the world go by rather than trying to capture it. But there was another technique that seemed even more transcendental than scuba – breath-hold diving. I watched, mesmerised, as a freediver slid gracefully down her line into the dark, deadly depths of the Blue Hole. I felt compelled to follow, but the numerous plaques on the wall alongside the entry point are a testament to the misfortune of many divers who have perished here. It’s no coincidence that many freedivers are also well-practiced in yoga. “It’s more than just breathing, it’s a state of mind” Monica explained. When I gave it a try, that state was of absolute calm and serenity, at least for a split second before the urge to breathe returned me to the hustle and bustle of the Dahab seafront. Breathe deeply from the diaphragm – that means your belly expands on the in breath and contracts on the out. For every one breath in, count two breaths out. Also on Facebook ‘Omdiver’ page and community. Posted in Medical.Tagged Dive, Diver, Diving, Health, Scuba, Scuba Diving, Training, Underwater, Yoga.